You know, this really started out far more innocently than it now may seem. And yes, I know you are snickering, because how on earth can one innocently go about a process than concludes with spooning into a deep casserole dish crusted with cheese and pasta in a two to one ratio? Well, you’re me, that’s how; and you needed to use up some milk. The quart of whole milk had been purchased last Saturday with the intention of using it in aforementioned spinach quiche, which, oops, didn’t require any. It’s sat unopened in the fridge since, leaving me the quandary of finding a recipe that used a large quantity of it, as my inner Yiddishe Mama would not allow me to let it go bad, and god knows I am not earnest enough to actually make my morning lattes at home. My first thought was chocolate pudding. It’s not really my favorite thing, but would that score me points with my eternal-inner-child husband or what? As I searched fruitlessly for a good basic recipe that was neither a pot de crème nor a puddle of ganache, I remembered that I also had a chunk of Cabot extra sharp cheddar to use up and now do you see how these things come to pass? 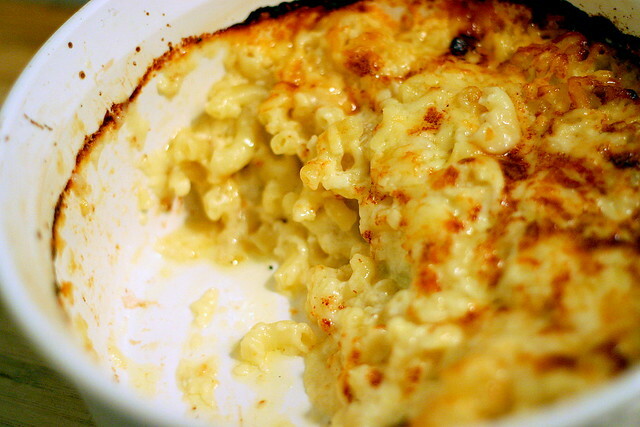 Mac and cheese is one of these sinful beauts that I encourage everyone to make, at least once. There’s no comparison, not even a nominal one, to the box mixes, and if I told that the essence of most recipes is to boil milk, stir in cheese, pour it over par-baked pasta and bake it until it’s crusted, would you then believe me? Sadly, finding a good recipe was not this simple, and seriously, when did mac-and-cheese get so gussied up? Bacon? Onions? Mushrooms? Blue cheeses? Heavy creams? Bechamel sauces with low proportions of mild cheeses? Curry? Blech! Look, there’s a place for fancy, and childhood classics aren’t it. A quick search on the New York Times website brought me to this archived article, and again to the notion that Julia Moskin is a woman after my own heart. She finds herself searching, like me, for an un-fussy, classic recipe and finds even more atrocities from white sauces, Worcestershire, smoked gouda and creamed onions instead. “None of the recipes came close to my fantasy of what the dish should be: nothing more than tender elbows of pasta suspended in pure molten cheddar, with a chewy, golden-brown crust of cheese on top,” she says, to which I say amen. Note: There is an additional macaroni and cheese recipe on this site, one we fell in love with long after discovering this one. Takes a bit longer, but whoa, those results are all that matter. Moskin actually ends the article with two recipes, but I went with this first one because it had more milk, only (heh) a pound of cheese, and had the added intrigue of not requiring either the par-boiling of pasta or pre-simmering of the cheese sauce. Huzzah for fewer dishes! As it turned out, the second recipe will not be necessary as this one is just perfect for anyone looking for classic, baked, no-fuss mac and cheese. Serve it with a g’normous green salad, in a feeble attempt at caloric balance, and wine, to remind yourself that you’re a grown-up. 1/2 pound elbow pasta, uncooked. 1. Heat oven to 375°F and position an oven rack in upper third of oven. Use one tablespoon butter to grease a 9-inch round or square baking pan. 2. In a blender, purée cottage cheese, milk, mustard, cayenne, nutmeg and salt and pepper together. * Reserve 1/4 cup grated cheese for topping. In a large bowl, combine remaining grated cheese, milk mixture and uncooked pasta. Pour into prepared pan, cover tightly with foil and bake 30 minutes. 3. Uncover pan, stir gently, sprinkle with reserved cheese and dot with remaining tablespoon butter. Bake, uncovered, 30 minutes more, until browned. Let cool at least 15 minutes before serving. * Next time, I will puree everything without the milk, and then add it in. I think that will put a finer grind on the cottage cheese, so no lumps remain. This is how my mom makes it–without any of that totally superfluous stuff. My boyfriend and I were just talking last night about making some homemade mac & cheese (because what good is the cold outside without comfort food?). I was looking for a yummy recipe that wouldn’t take me all day long to make. This looks pretty easy and delicious! Thanks for reading my mind and posting it! WOWOWOW!!!!!! i’ve been on a no-cooking protest since breaking up with my live-in BF a month ago (a relationship that had brought my inner domestic goddess to the forefront), but i think this is going to break my holdout! #1 cause it looks AWESOME and #2 cause he would have LOVED it and i’ll remember that as i eat every.last.bite. THANKS for sharing this one!!! Sounds good. I just made mac and cheese on Monday, but it was the ever delicious recipe from America’s Test Kitchen which I love – also simple and definitely worth checking out. Yep, it’s a good one. Ben and I made it in January (if you click on my name, you can read about it), and were immobile after ingesting all that cheese. IM-MO-BILE. Good, though. Hilary – I know! I admit to being tempted by the prospect of panko on top, but it doesn’t need it. I was also tempted to use a crÃƒÂ¨me brulee torch to really crackle it up, but then remembered that I don’t have one because my mean (hee) husband thinks I might be too clumsy to play with fire. I have no idea where he gets that idea. Sarah – So easy! I hope you like it, too. Bridget – What is it with men and a mac and cheese obsession? I loved this dish, but it wasn’t a religious experience for me. I’ll just shut up now, before people start pointing out yet again how nutso I am. Dahlia – Ooh, do share. I’ve been meaning to get their cookbook for eons, and have no idea why I haven’t done so yet. Luisa – Nice! I have no idea how I missed that; I thought I’d read your whole archives when I found your site a while back. It’s so filling, but I loved that. One big scoop, a giant romaine salad and an excess of red wine (actually, that part not recommended) and I was done for the night. Got to love it. My Aunt, is notoriously famous for bringing baked macncheese to each and every family gathering ever held! Her recipe is as follows: Boil16 oz bag of large elbows. Drain. Dump into glass 9×13 dish. Take stick of butter, cut into chunks and dot on top of pasta, salt, pepper add 2-3 cups shredded cheddar, pour milk over the top until it comes about halfway up the sides of the pan – pop into oven at 350. In 15-20 minutes (or when you think about it) stir to combine. Then let bake until the top achieves the preferred amount of cripyness. Nothing fancy. Just good! And yes, any inner child screams to be fed this! I’d been thinking about mac and cheese for some time, and now it is totally inevitable. I currently have a little excess whole milk left over from the visit of a friend with a small child. I’d considered tapioca pudding – because that’s my excess milk default – but now I’m all about the mac and cheese. This will be perfect dinner on Sunday night with simple salad, crusty bread and some good wine. Bless you! Also, the brownies were pretty fantastic, and guests are always impressed when brownies are truly made from scratch. I overbaked them by about 2 minutes, I think, but next time they’ll be perfect. Just curious what you think about Ina Garten i.e. The Barefoot Contessa?? Mm that looks delish. I like Alton Brown’s recipe (in theory, never having had the time to make it)- my boyfriend isn’t a fan of baked mac&cheese unfort. but Alton also has a “stove top mac & cheese” recipe I’m keen on trying. Will you come over? And bring some of that Mac & Cheese? Please? If you ever decide to visit Nashville, my husband and I will be happy to take you to a lovely restaurant here that serves the best Mac & Cheese ever. Muffy — where? where? I may be headed that way after the first of the year! It’s like youth in a bowl. Macaroni and cheese is about my favorite food in the entire world. However, I tried this recipe a while ago, and it came out looking nothing like how yours turned out, and tasted horrible, so we threw it away. Now I’ll have to figure out exactly where I went wrong, because that looks amazing and I want to try it again. while sick a few weeks ago i managed to come up with an even easier recipe, b/c when ones sick, theres no need to make life complicated, no? This is bizarre – I actually had the NY Times recipes saved in my recipe inbox, and was emailing my best friend all yesterday morning, before you posted this, about how I planned to make it last night. What timing! Anyway, I decided to try the other recipe from the article (the one for Crusty Mac and Cheese) bc the crust is my favorite part. While it was delicious (I’m not sure how a dish with pasta, milk, butter and A POUND AND A HALF of cheese wouldn’t be) I have to say that the crust is perhaps to much of a good thing. You end up with a thick top crust and a think bottom crust, which are lovely, but I ended up missing the gooey, creamy middle. Next time, I think I’ll try this one. P.S. 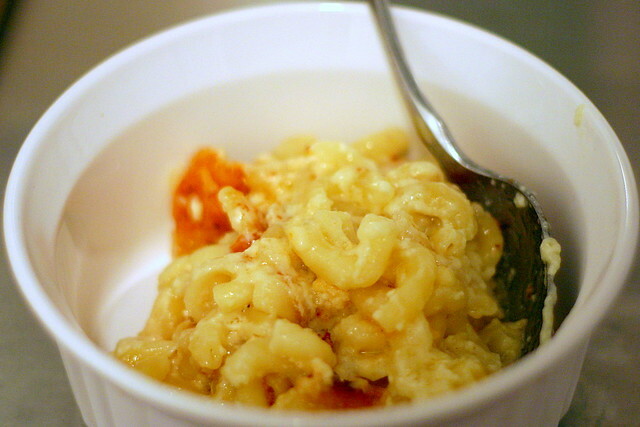 My husband just emailed me from work: “We must make that mac and cheese from Smitten Kitchen.” End of email. Can’t you hear the desperation? I am totally cracking up at Michelle’s comment above. Farmer Beth – Your Aunt’s recipe is exactly what I was looking for! Yet, now I’ll stick with this, only because I didn’t even have to pre-boil the pasta, and in a home without a machine dishwasher (as opposed to the man dishwasher, my husband), every dish saved counts. Nikki – I’m glad you liked the brownies, and hope you’ll love this mac and cheese as much. It tastes so good with salad and wine. Ooh, btw, next time I might try to bake these in individual ramekins. I love the idea of pre-portioning it. Yvo – I saw that one in my Googles, the Alton baked one, but then read a review that said it was bland. Of course, one review really means nothing, but it kept my search going. Jocelyn – I’ll bring it over for a dinner party, with pleasure. We totally need to have one, too. Your thoughts? Muffy – I totally want to go to Nashville! Can we go for BBQ too? Brilynn – Aww. For me, it would have to have chopped up hotdogs in it – that’s how I liked it when I was little. Yech. Also, it would have to be Kraft from the powder. Not that my mother didn’t know how to make the real thing, but I liked the box stuffÃ¢â‚¬Â¦ when I did know any better. Jessie – What happened? Something went wrong? I found this so easy. Let me know if you try again. Ann – Even easier? Do tell! I thought you’d love the lack of extra dishes required for this, being a tiny-kitchen-person too. RA – That place is interesting; I’ve never heard of it! That said, not that I don’t think they could do a good job (that brie one aside, it just sounds weird) but, I’m always skeptical about having other people make things I can so easily do myself, with no need for the cost-cutting measures inevitably taken when making things in quantity. I have to see if any of my friends who live nearby have been there. Also, your husband cracks me up. KikiLee – I’m so glad someone tried the crusty one! I was curious, but as I mentioned, went with this first because it seemed easiest. I’m sorry you didn’t love it but feel almost certain you will like this. Let us know how it comes out for you if you make it. Now I’m starving and have neither Mac on hand, nor cheese. What is a girl to do! I love a dinner party. Just when the BDL is finishing up its remodelling. I am going to LA next week, but maybe after I get back? I think I remember that article! I love mac-n-cheese. My grandmother always made it with the large elbows, and I carry on her tradition at the holidays for my family that misses her. I, however, like the small elbows. And I have a great recipe with a breadcrumb topping. And now that the temps are below 50, I’m going to make it soon! Oh my, I think I drooled a little……… That looks fantastic! Hey Deb – I just wanted to tell you that I saw this post this morning, cancelled my plans to go out tonight (my semi-excuse: the dog I’m dogsitting seemed really lonely, and I didn’t want to leave him alone ALL NIGHT), and I’m currently anxiously waiting the recommended 15 minutes post-baking pre-serving. you must try barefoot contessa’s macaroni and cheese. sinful yet elegant enough to serve to a large crowd! ive tried this recipe!! =) thought it was good, but i thought it was missing a nice crispy topping, so i added buttered breadcrumbs to the tops.. mmm…soo much better!! Park Cafe has the awesomest mac & cheese I’ve ever tasted. It’s a side dish, and comes to you sizzling and freshly cooked and is oh. so. good. Then top off your dinner with their creme brulee. It’s served between layers of phyllo dough with almond slivers. SO good. Just tried this recipe last night and it is awesome! I tried just puree the cottage cheese first in the blender and was unsuccessful. It may be my low-end blender, but is just pushed the cottage cheese to the sides without puree-ing. Used Grey Poupon as well b/c I didn’t have any mustard seed. I’m trying Ina Garten’s recipe next, but it seems more labor intensive. We tried the recipe last night too – perfect halloween dinner. We as in “I worked all day so I made my mother cook it”. Despite my urging she did NOT do a cheddar/american cheese combo…I suppose I really didn’t care considering the amount that I ended up eating. Quite tasty though…thanks for trying it first. I see that several people besides myself had the brilliant idea to make this as a delicious, warm, feel-good meal on Halloween night. And it sure lived up to the hype! Great recipe. I actually made this with skim milk, lowfat cottage cheese and 2% cheddar and it still came out great! Thank you for the recipe. I love, love love your site and am currently scouring the archives. That’s how I came up on this post. I have to tell you thought – I tried this recipe and both my and my boyfriend really didn’t care for this recipe. I thought the cheese mix curdled a bit and the oils separated. I wonder what I’m doing wrong…dunno. I’m gonna stick to my tried n true white sauce/cheddar combo. Anyway, love your writing and your site, keep up the great posts. I had the same problem! It was better the second time I made it – I posted a comment with what I changed today, so it will be at the bottom of this page. Just thought you might like to know I tried this last night and was really impressed at how well it came out for the simplicity of the recipe. Thanks for the “plain folks” version! I don’t have a food processor, only an ancient blender, so shudder at blender/processor recipes — but the only casualty was a chunk of finger in the box grater. I know, ew. First, some history: macaroni and cheese has always–for as long as I can remember–been my favorite food. I have many other loves, but mac and cheese always comes out on top. When I was growing up, we had an older lady that went to our church, Miss Norma, that was all country and made a fantastic homemade macaroni and cheese. She knew I loved it so much that she made me a mini pan of it for a gift when I graduated from high school. The other night, I decided to finally make this recipe, although I had an eye on it since I first read it. Oh. My. Gosh. I will never make another macaroni and cheese. This is the first homemade version I have ever made, and I love it even more than Miss Norma’s! It is soooo rich and cheesy, and I agree that a little cheese on top makes a perfectly crunchy finish! We actually did use whole wheat elbows, and it still worked great. I set the timer to wait the 15 minutes after pulling it out of the oven, but we only made it 7 1/2 before diving in. My fiance doesn’t even like macaroni and cheese, and he has been devouring the leftovers with me! Thank you for the recipe! Yes, indeedy, that is one fine macaroni & cheese. It’s over-the-top cheesy, but sometimes that’s just what you need. And that no-boiling-the-pasta thing is wonderful. This recipe was very tasty, but definitely too cheesy for my taste. Yes I said it! I would have like a little more creamy and a little less cheesy. So next time I will decrease the cheese to 3/4 lb and increase the cayenne a bit. It was very good with hot sauce on the side. Thank you for another good recipe! This was really great! If I had thought about it, I probably could have guessed that it was going to firm up a lot, but it looked so soupy… it wound up a bit overcooked. But the flavor was great, and it was so easy. A note to anyone else making it in a toaster oven though: Don’t put the top layer of cheese on until the last 10 minutes of cooking or so. I had to stir the crust in, or else it would have burned (another of those things that if I’d thought more, I probably could have avoided). It was still really, really tasty. I made this tonight…it had a really, really good flavor to it. I think I cooked it too long because it was kind of dry. That can definitely be alleviated next time I make it. I have a dish of this sitting in my oven right now. I have high hopes! Smells great. Oh, my. It was fantabulous! wow this looks amazing! and amazingly simple- cant wait! I’m not a huge mac-and-cheese fan, but I’m thinking of whipping this up for my hub. If I do, he will no doubt track you down so he can give you a hug because you got his wife to make him a big ol’ cheesy dish! I made this for a family potluck type dinner, and LOVED it! My husband could taste the cottage cheese though, and wasn’t crazy about it. Was it in there just to make it creamier, and if so, do you think cream cheese would do the same thing? my husband and i are on the quest to find the best mac & cheese recipe EVER, and this is next on our list to try. I did a loosely mimicked (due to the constraints of what was in my fridge) version of this that turned out pretty well. I think Cindy’s cottage cheese problem might be solved by using ricotta instead – it’s smoother and worked well for me. Also, this recipe (or at least my cobbled-together version) reheats much better than most m&c recipes I’ve tried. I’m off to make the by-the-book version now. thanks for this recipe, deb. i doubled the recipe plus added garlic and jalapenos during the cottage cheese blending phase of the recipe, and it turned out great. there was none left at the end of my superbowl party and i’ve led people to your blog. I don’t know what it is about men and homemade mac ‘n cheese but whenever I make this for my husband he showers me with praise for days! I’ve been using a terribly involved recipe – originally from the Nov ’06 recipe of Real Simple – but I can’t wait to try this one. Thanks Deb! I have this in the oven right now. We’re going to have this with a green salad, wine, and Garret McCord’s blondies that are on Simply Recipes right now. My boyfriend is one happy, happy man. Holy crap! I just made this because I’ve had it saved in my bookmarks for forever and four days. So after coming home from work and sitting for an hour and a half, I decided that it would be the perfect time to have some mac and I whipped out this recipe. HOLY MOTHER OF GOD. it is soooooooooooooooooooooooooooooooooooooooooooooooooooooo good! I was a definite skeptic about the uncooked mac and the un bechamel based cheese sauce (i’m from a line of boil the pasta, make a white sauce, add cheese, combine, top with breadcrumbs and butter cooks) but good lord it was so freaking good! BUT two things I would change: 1) cut the salt. maybe because i used salted butter but it came out very very salty. 2) cut the butter on top, it just made it a touch greasy. however, TOTALLY FORGIVABLE. WOW. My husband ate nearly the whole thing himself! And so easy – this is now one of my favorite easy dinners, and I suspect we’ll be making it a LOT. Thanks. I am making this for Father’s Day. It’s in the over right now and smells amazing! Hopefully it turns out.. I can’t wait to taste it!!! I’m making this for my husband tonite! this will be my first time making baked mac n’ cheese!! I did end up making this for Father’s Day, and it turned out amazing. People wouldn’t stop complementing me. There were no leftovers, and I DOUBLED the recipe. I will be making this again for the 4th of July. I’m now known as the “Macaroni Lady” as I have been told I will be bringing it to every family get together. Mmmm! I just finished my first bowl. I made it with penne and ricotta cheese cause that’s all we had but it was super yummy nonetheless. I am a new follower of your blog and I love all your photos! Mac n Cheese is just the ultimate indulgence. And I don’t understand why some people don’t get it. Poo on them. This was wonderful, I added 1/2 lb. of crumbled bacon and some onion, it was the best I’ve had for a very long time…I also replaced the cottage for riccota. Fabulous recipe, and I appreciated the suggestion to omit the nutmeg. Perfect fall comfort food; will make again. This is the second time I’ve made this mac n’ cheese for my picky stepdaughter and my somewhat-picky husband. For my own personal preference, I cut the cheese down from one lb to 9 oz and it was STILL FABULOUS! I know this recipe has been here for a long time, but I do hope that you will find this comment and know how much I appreciate your posting this recipe! Oh, and BTW, both hubby and stepchild would absolutely FAINT if I told them there was cottage cheese in this recipe! Heh. Heh. That’s just gonna be between you and me and your other readers! love love LOVE this recipe! i double it for my family of 6 and we all eat until we are stuffed. i was SO stoked to finally find a great m&c recipe that didn’t require parboiling and the bechamel. We have been looking for a good baked macaroni and cheese recipe for awhile… so we were excited to run into yours. We tried it and it turned out great! So delicious and creamy. We did substitute some of the cottage cheese for cream cheese and still worked great. Thanks! I am really looking forward to trying this recipe tomorrow night with my boyfriend. He is a beer lover and I was wondering if you had any suggestions on a type of beer to pair with it. Hi Lauren — I don’t do beer and wine recommendations. It’s just not my area of expertise, but also, I think people should drink what they like, not what they’re told to. You can never go wrong with someone’s favorite beer. I’ll have to try this one! We’re big mac n chz hoarders here. I can never make enough to have leftovers! The recipe on cookingforengineers.com is the favorite so far – creamy & delicious, yet so thick & cheesy you can stand a fork in it. I do skip the topping he puts on it, though. (Yuck!) For quickness & ease without the Kraft box, we love Alton Brown’s Stove Top mac, minus any dry mustard or ? I do admit to adding tuna to my mac n chz and topping it with crumbled Ruffles. Yikes! Did I say that out loud?! Every family should have a favorite mac’n’cheese recipe that isn’t elaborate. I have one already- involving tasty things like garlic, thyme, and dry mustard in addition to heaps of cheddar cheese- but if I didn’t this recipe would definitely be an excellent place to start! I have no idea why, but mine was not creamy at all, and the top was very hard. If anyone can help me out here, it would be much appreciated. Thanks. Oh goody, you still check up on this. I have to say, this was AMAZING. Made it tonight for a fantastic Fat Tuesday dinner and it certainly fit the bill! Although, you’re right about it being filling — I’ll probably be eating it for the next month, haha. I made this a few months ago and it was deeeeeeeeelicious. Straightforward, so cheesy, and VERY filling. I know it’s a little late but, Aladyinredpolish, what size dish did you use? I used a bigger dish than what is recommended and the creamy middle/crunchy top ratio was a bit off. I’m making a double batch of this mac and cheese for a beer-brewing party this weekend and I can’t think of a better crowd of people to serve it to. I’ll use proper size dishes to make it perfect. I anticipate being carried around on people’s shoulders as they cheer my name. Great macaroni and cheese. I really appreciate that the neither the macaroni nor the sauce needs to be pre-cooked. Made half a batch using extra sharp cheddar. Very tasty. I can’t wait to try this! My dad used to always make the most amazing baked mac and cheese that he was well known for. My boyfriend insists that he doesn’t like baked mac and cheese but hopefully this recipe well change his mind since I can’t make my fathers for him! Made this tonight — AWESOME. I made this tonight – I was so intrigued with a recipe I didn’t have do preboil noodles or stand over the stove making a cheese sauce & called for pureed cottage cheese. My 5 year old pretty much did everything to boot! Great recipe for kids. I did love the noodles, as well as my husband who commented “The noodles aren’t mush!” The cheese sauce turned out very gritty though–little grainy lumps of cheese. The cheese crust was the best. I will keep the method but tweak it. I love Alton Brown’s Stove-Top Mac, it’s as easy as the box, but homemade. For that sliceable like-grandma-made, I love cookingforengineers.com’s. Nothing is as unhealthy but good as my mom’s – you feel a coronary coming on but can’t stop. I plan on making the other one of SK’s next, though. Oh man. I just made this, with the addition of some panko on top of the cheese. It was beyond amazing, and easy easy easy (as advertised!). Thanks for this. It’s going into my arsenal, for sure. To begin with, this looks amazing. Would it be a sin to add some green chile and a feta on top? After a stint in Albuquerque, the fiancee and i have a full blown addiction to the green. Unfortunately it’s nearly impossible to find in Kansas. Secondly. I didn’t see a “no boys allowed sign” so I do hope I’m welcome. I am the cook in the household and am always looking for great recipes. About this whole cottage cheese ingredient…I LOATHE cottage cheese. I have this whole texture thing with different foods. Can I substitute another ingredient (and please don’t say something equally as distateful, like ricotta) or can you pinky swear promise upon consumption that I won’t even remember I added the dreaded ingredient? Winters here in Kansas can get cold, and I’m currently 4 1/2 months pregnant…perfect excuse for finding the perfect M&C recipe to always have on standby! Perhaps my cheese was too strong, because I needed to take a bite of salad in between devouring the pasta. My family loved it, but then again, it’s just my mother, brother and me. My mom bought the cheese probably at some outrageous price. So, next time I make it, I would use a more mild flavor. This was an incredible recipe! I have been craving real mac-and-cheese for months! I am new to your blog. I have been sick on the couch for months I wish I discovered your blog months ago! I have read all of your postings and love your style of cooking! Every recipe I have tried on your site has worked! I can’t say that for many food websites! I have been telling everyone about you, thanks for sharing your kitchen and your life with the world. You are doing a wonderful thing. Thank you! Deb, I have made this recipe dozens of times for myself and friends when I wanted some comfort food. Tonight I am cooking for 40 hungry Jews; 6x’ing this recipe. I KNOW it’ll be a huge hit. Thanks for the great recipes! I’ve made this with cottage cheese and didn’t like the consistency – even after pureeing it was a bit gritty. I didn’t have cottage cheese this last time so I substituted nonfat Greek yogurt. It’s much better – smooth and creamy, perhaps a bit more tart (although that could have been the extra-sharp cheddar). And it reheats pretty well. I hate cooking pasta then turning around and baking it into submission. This is a keeper. What a great recipe!!! Just the perfect consistency and cheeseiness. Thanks. mmmmmmm sounds great! i can’t wait to put this in the oven!! I made it twice, once with full fat cottage cheese and once with low fat. I was skeptical on the low fat, and it seemed a little watey when I pulled it out of the oven, but it was actually great when I dove into it half an hour later. I think I added too much pasta on version @2, so it was a little dry, but version 2 was perfect. This recipe is a keeper–can’t believe how easy it is! Deb, thanks sooo much for this recipe! It was very tasty. I noticed that you skipped the nutmeg, but I actually left it in and was pleasantly surprised with the aroma it provided the dish. Love your site; even when you post recipes for foods I don’t necessarily prefer, your photography makes me want to eat it anyway! You’re very talented. My wife and I decided to try one meal a week from your site and so far we’re loving it! I’ve been coming back to this recipe for a year – afraid of the cottage cheese, but attracted to the ease. I always ended up back at the Martha Stewart recipe. However, last night, after being phoneless all day and having my car broken into, I needed mac n cheese. THis totally fit the bill as an easy, yummy, 3 dish meal on a weeknight – can’t wait to make it again. Made this last night – ended up kind of oiling yet dry. What did we do wrong? Not enough milk / cottage cheese? We didnt have 1lb of cheese so i used about 2/3lb and topped up with parmesan .. could that be it? rf — This is actually not, say, the “goopiest” mac-and-cheese; it shouldn’t really be dry but it’s not as creamy as one with a white sauce as a base. If you want a ridiculously creamy, almost classical, mac-and-cheese, you might also enjoy Martha’s recipe. A little more work but it might be right up your alley! I made this when I’d already used half my block of cheese for other recipes, and consequently, had half the amount I needed for this. I found that this tasted better reheated with extra cheese and a bit of milk to make it saucy. I’ll make this again when I have enough cheese in the house. My first time ever commenting on a blog. Been drooling over your blog for a couple of months now and yesterday, while looking for a chicken recipe, saw this lovely mac one. Too lazy to check metric equivalents, I added a whole 500 g packet of wholewheat macaroni elbows to the pot. Decided that it might be advisable to check and realised that I then had to double the rest of the ingredients. That had the result of making a HUGE amount which is wonderful – I am adding leftover shredded chicken to it tonight and then we will be digging in again! I used yoghurt instead of cream cheese and crumbled in about 100g gorgonzola that I had available on top of the rest of the cheese. Suffice to say it is very filling and intensely satisfying. I guess if I ever had to request a “last meal” this would be it! I threaded bacon onto skewers, dotted sweet chilli sauce on them and after grilling it to a yummy jammy crisp, served that as a side dish to keep my hubby silent about the absence of meat – not that he could say anything, he was too busy munching more mac+cheese! We just polished this off. Absolutely delicious. I used slightly less cheddar than called for — maybe 3/4 lb., and I also cut the butter and salt by about half. As Deb suggested, I pureed the cottage cheese before adding the milk gradually. No grit at all. Just a great, simple rendition of mac and cheese. i made this for a friends whose dad is on hospice and the family has pretty much been living at the hospital. my friend and her husband have 2 little kids so i hoped that this was kid-friendly and adult-friendly also. it was both and it was a hit! i also made a batch for my family and we finished it in 2 days!!! once again thanks! I was just wondering why do you need to puree the cottage cheese and milk first? And, also, could I use cream cheese and sour cream in place of the cottage cheese? I use cream cheese and sour cream in all my macaroni and cheese recipes, and I don’t want to let it go. also, can I use evaporated milk instead of regular milk? I tried this with ricotta and I found it was a bit dry and didn’t seem ‘cheesy’ enough. I think you do need a lot of cheese that melts into strings (which ricotta doesn’t do, but cottage cheese kind of does), to make it cheesy. Was easy, though, and that’s always a great thing! Wow – I’ve made this three times and it was so sinful and delicious. I keep meaning to make this to bring somewhere, but it’s so hard when I make it not to dig right in! I found even if I blend the cottage cheese first, it still kind of “clumps” back up during cooking. I’ve never liked cottage cheese, but thankfully, cannot taste it in this recipe. I’ve used it for a few years now, and it makes a really nice mac & cheese. It should still work with lowfat. Otherwise, you might try ricotta (if it is available). Oh god, I’m gonna make this. I grew up trying to convince my mother to buy boxed mac and cheese whenever possible (I can count the number of times she agreed on one hand), as she always made it homemade. With onions. And cracker crumbs. Both of which I despised immensely. Even if I couldn’t really taste the onions, I knew they were there and that made it WRONG. I love you, mom, but I can’t find it in myself to accept your recipe as real mac and cheese. I used ricotta, skipped the butter, and used some ends of extra sharp cheddar and garlic herb cheddar and parm (less than a pound though) along with whole raw milk. It’s so good that my picky three year old asked for seconds… but maybe a bit dry. Mmmm! Second time and it’s even better… more cheese this time, cottage cheese, I still skipped the butter… it’s not dry at all, so gooood! I’m making this tonight for dinner. It’s rainy, soggy, windy and cold here in Seattle and this will be the first time I’ve ever made homemade Mac & Cheese. My mom always used the “blue box” and I’ve only ever had dry, extra greasy, not-cheesy-enough, or weird-ingredient homemade Mac. So… this post speaks to exactly what I’ve been looking for in real Mac & Cheese. I blended the cottage cheese in the food processor w/o milk first and it got very smooth, so I’m looking forward to a fab dinner! Thanks!! Love, love, love your blog. Ok, best thing ever. Add an egg, it does good things. also, when on the prowl for a recipe, check the box! many many years ago, my mom’s friend made macaroni and cheese while my mom was visiting and my mom was shocked to learn that it came from the back of the mueller’s elbow macaroni box. my mom has used it ever since, tweaking it however she likes every time, and it is always delicious (and never includes any funky stuff). i always forget that boxes (particularly for products that have been around forever) have recipes on them and not only that, they are super time-tested and, normally, easy to adapt to my needs. My husband was in the hospital Monday for an awful case of food poisoning and requested “comfort food” when he finally got his appetite back. I couldn’t think of anything better than this mac and cheese recipe. It was delicious. We used a good sharp cheddar and a bit extra cayenne and it was exactly what the doctor ordered! Just wondering if this will safely serve 5 adults for dinner? Just tried your mushroom lasagna, apple and cheddar scones. Easily serves 5, I’d say. I did this with sour cream instead of cottage cheese, and a combination of odds and ends of half and half, cream, and soy milk for the milk. Came out fab! A few friends and I are Smitten Kitchen fans and knew that we’d be making at least a thing or two from your site for my 21st birthday dinner. Cheese is one of my most favorite things, so we took your advice and served it with a “g’normous” salad, wine, and bread from the local market. It was a fantastic addition to my evening, and was so rich and so well balanced by its counterparts. Thanks for the recipe, Deb! Fabulous!!!! and super duper easy. My kids loved it and so did I. I expect this will be my go-to recipe for mac-n-cheese! YUM! I made this today and I did use the skim milk and nonfat cottage cheese and I can’t imagine it being any more fabulous! This is exactly what I was looking for and it was so easy to boot! Thank you! Also, I made the pound of cheese with half sharp cheddar, a bit of parmesan and the rest colby jack. Gooooood! Best attempt at this yet…this is my new go to recipe for baked mac n cheese! OMG! This is the easiest mac and cheese I have ever done in my life…I never cook on a Friday night but I wanted something comforting.I didn’t have a blender, no cayenne and no dry mustard. I used my mixer to blend the ingredients. I used almost a tsp. of ordinary yellow mustard, 2% milk and a little canned milk and I definitely added some nutmeg (dried). It is sooooooo good. I can’t believe it. My only concern was the placement in the oven since my element is at the TOP of my electric oven. Was it supposed to furthest away from the element? I wonder if subsituting the whole milk for a 1% would work, or maybe condensed milk? And using 2% cottage cheese…I have made this twice already but I am always trying to make things a bit healthier. or maybe subsituting fage greek yogurt might work as i have seen people using sour cream instead of the cottage cheese. Certainly an easy recipe and with half white sharp and half medium yellow Tillimok this came out as tasty as it looked! I bit of heresy however, I tossed in two cans of Goya Pulpo in hot sauce (that’s octopus in an oil based sauce – I drained it well). Was well satisfied with the result on a chilly southern california day. Happy New Year to all! simply amazing! and ten times easier than the recipe i grew up with. i love the 2:1 ratio of cheese to pasta, but the idea “no-boil” was what really grabbed me! Ok, this looks amazing. I love the addition of cottage cheese in mac n’ cheese. This reminds me a bit of our family’s famous Great-Aunt Betty’s mac n’ cheese recipe. Hers calls for cottage cheese, sour cream, an egg and extra sharp cheddar. It’s tangy and scrumptious. The secret is to underboil the elbows and let the mixture sit for at least overnight before you bake it. It’s better if it sits for 24 hrs. I don’t know why, but it’s magical. I am going to try your version for more immediate gratification! Thank you. I am smitten with your kitchen. Hehe. I think this is the best mac & cheese I’ve ever tasted-and I was a big fan of the other recipe you refer to before this. This one is a keeper! Love your site! I made this with 1% milk, 2% cottage cheese, and a mix of mozzarella and cheddar; because that was what was in my refrigerator. It was delicous! My daughter couldn’t wait long enough to sit down, and tucked into her dinner standing up! I had to hide the cottage cheese container though, or she would not have eaten it! I liked that this was easy to make, no cooking the noodles on the stove or making a sauce. But, it wasn’t creamy enough for my liking – it seems almost grainy when I was eating it – I think that I’m going to have to stick to making a sauce! My husband said, “Phenomenal.” I let it sit a little too long after it came out of the over, making it more dry than I meant, but boy, was it good. I also used a larger platter than I needed to, only had an 8×8 and a somewhat larger oval, which I used. Might have been too large. Really great, easy and totally delicious for all ages, as we proved tonight. Thank you! Is it possible to make this ahead and freeze it? has anyone tried that? I’ve just discovered your blog and had to try this. It tasted amazing, but seemed a little dry since I’m so used to overly cheesy, soggy versions (I also used 3/4 lb of cheddar). It was different, and I liked it! I love my more intensive recipe that involves making a sauce and all, but you may have won me over with the no boiling thing. Oh, and don’t be so quick to dis adding a bit of bacon to mac&cheese – it is phenomenal! Delicious!! I used ricotta instead of cottage cheese, and it still turned out great!! And it reheats like a dream (even 5 days later – my wonderful lunch today.) Definitely a recipe I’m holding onto! this was amazing..and i used fat-free everything (except the cheese!). it was perfect! Thank you so much! For a first-time mac-n-cheese maker this doesn’t look intimidating. Im trying this tonight! Thanks for the yummy idea! First time to the site via my colleague who is a devoted reader — clicked on “Surprise Me” and landed here — holy catfish! 1. What a great feature and 2. What a GREAT recipe to land on! Thank you thank you thank you! I’ve been using your recipes for a little over 4 years now. I cook for Hillel of Colorado on Fridays, feeding somewhere between 50-80 people. This recipe has been made each year, and is one of the most popular dishes I’ve ever made. I dunno what it is (yes I do, whole milk, full fat cottage cheese, and 6lbs of extra sharp cheddah) about this recipe, but it’s so easy, and SOOO delicious. Thank you for everything you’ve done with this site, you continue to amaze me. Just wanted to let you know that dozens of people will enjoy this tonight and it’s all thanks to you! Oh bummer… the only thing I have is orecchiette, so I guess I’m going rogue here. It still looked delicious while putting it together! Listened to you on Martha Stewart Everyday Foods last week while driving to my sons soccer game. Went to The Smitten Kitchen as soon as I got home. Love it! So, I am always in search of fabulous Mac & Cheese, always convinced that no matter how delicious, there’s a better recipe to be found. Well, my search is over, I will look no further! This is, hands down, the most delicious Mac & Cheese I have ever had! Thank you! Hi Deb – at 8 months pregnant this recipe is the perfectly simple and delicious – THANK YOU! I keep thinking I will freeze some for life with a new baby – but then we eat it all. I have made one adjustment – I add a head of raw cauliflower cut into mini florets (the size of the pasta) and it adds a great flavor and a veggie…making a one dish meal that almost feels healthy. Thanks! I am the laziest of lazy chefs, and I have simplified this recipe even further! I use literally only three ingredients: pasta, half and half, and shredded cheese. If I’m feeling particularly lazy, I’ll even use a disposable pan. ;) But even with the reduced ingredients, it comes out simply amazing. It’s so easy and great for family parties. We just had one yesterday, and I made a double batch of this – it was a huge hit with the adults and kids alike. Anyway, for anyone who is interested, all I do is pour the pasta into the pan, cover that with a pint carton of half and half (no measuring! told you I was lazy, LOL), mix those together a bit to make sure the pasta is all covered and distributed evenly across the bottom of the pan, and then top with 3-4 generous handfuls of shredded cheese. I don’t even bother mixing at this point. I just make a nice thick layer, then cover with foil and pop in the oven for the first 30 min. When it comes out, I sprinkle with another generous handful of cheese (no butter) and pop back in for the last 30 min. It truly doesn’t get any simpler. And when I buy the pint of half and half and a disposable pan, I literally have no clean up other than the serving spoon. Deb, thanks for showing me that I don’t have to go through all the mess and hassle of making a sauce and cooking my pasta first to make amazing mac and cheese! Is there any better comfort food? Deb, I love this recipe!! I have tried Martha’s mac and cheese but didn’t think it was worth the time and effort. I needed a mac and cheese for a busy weeknight dinner and this is the one. I love it. It is so simple and delicious. Thanks, I love your site. Thank you so much! As a 33 year-old bachelor, I love this site! I have tried to cook before, and while it’s obvious that I cook with love, the results have been mixed and sometimes even completely disastrous. I seem to be the only person in my family who was not born with the Southern Cooking Gene, and actually believed that I was hopeless in the kitchen and resigned to a life of take out, cereal, and sandwiches. Macaroni and Cheese is my favorite food ever, and I happened upon your website and became, well..smitten! Crossing my fingers and hoping for the best, I made this recipe on Friday night, and when I finally tasted the finished product, I could hardly believe that I had made it! Baked Macaroni that was rich and creamy and cheesy all the way through and didn’t require preboiling the noodles no less! Since then, I’ve made your Dulce de Leche Cheesecake Squares (HUGE hit at work!) and have my eye on the Pumpkin and Black Bean Soup next. I’m legitimately excited to go home from work and cook now! Thank you so much for giving me confidence in the kitchen! Who knew Macaroni and Cheese could be so profound?! AHh..im making this tonight – but only have Penne! Will this be an issue?! If I make this ahead (up to putting everything in the pan) and leave in the fridge for a day before baking, will it be okay? I’m worried that the noodles will turn to mush if I don’t bake right away. Thoughts? Hi Noelle — You can always keep the noodles a bit al dente (or, even more so) and it shouldn’t get too soggy. Ok, Deb- I’m having a mac n cheese crisis. I searched high and low for a great recipe at Thanksgiving. I was leaning toward the Martha Stewart one, and after seeing that you’d posted it, decided to go that route. In the end…yeah, it’s good. Solidly good. But for the PRICE and the EFFORT I wanted to be blown away and though it took me 2 days to admit it (because I wanted to have finally found THE recipe), I just wasn’t. It was a little flat for me. So here I am again. I’m interested in this recipe. Dare I try it for Christmas? What are your honest thoughts when comparing the two. Here’s what I’m going for- a nice “looseness”; not runny by any means and not even neccesarily creamy, but not dry. I hate the mac n cheese that you can cut into chunks. And a sharpness. Even with the pecorino the Martha recipe lacked any bite. Thanks for any thoughts. Love your site. Ah- one more question…how does this do when making ahead? That’s always a problem too. Wondering if baking ahead will dry it out? Hi Carli — So, the Martha one will reheat better because it has a bechamel (white sauce) to suspend the cheese and this is mostly melted cheese and milk, no sauce. No mac-and-cheese reheats perfectly, btw, they all have a little oiliness from cheese that’s melted being melted a second time. But the white sauce/bechamel ones do so slightly better. That said, you can also make the whole thing the day before and just bake it the day of and it will be bubbly fresh. The Martha one is a little looser, but could be made more so by holding back some noodles, making more sauce or even playing around with dialing the flour back in the sauce a little, making it less thick. You also could punch up the cheese — using all cheddar for the gruyere and increasing the salt. Hope that helps. @Michelle (143)- If you are still checking this, I used your “lazy girl” recipe and it was the ultimate success! I am keeping it for all future mac and cheese uses, especially on a cold night with a good movie or tv show. THANKS! I made this and froze it (to eat in a few weeks when our baby arrives and I’m too crazed to make even something as simple as this recipe)… At what temp and for how long should I bake it when we take it out of the freezer? I just made a triple batch (that’s a LOT of cheese). It’s a favorite in our house and will come in handy in a few weeks (I’m freezing some) when my husband guts the kitchen (gah!). Thank you! Ha! We eat homemade mac’n cheese (The Joy of Cooking) and huge salads all the time! One of our favorite combos! I have made this yummy Mac & Cheese once a week for the past four weeks since I discovered your recipe. Love the simplicity. I too had a bit of a grainy texture the first time I made it then realized that it will be creamy the more you “gently stir” after the first 30 minutes of baking. It has made it to my “favorites list”. Love your blog! Many thanks. Can I just half the recipes if I’m making it for only two people? Made this tonight, followed recipe to a T. Was terrible, hard to choke down. Disappointed and a waste of $$$ for all the cheese required. Sadly, the hunt is still on for a decent edible mac n cheese. Sorry to hear that Allison, I have made this at least 10 times and it’s been delicious each time. Did u use full fat? Okay, I bought a pound of arugula at the farmers’ market yesterday, so started wandering around your archives looking for suggestions. Ran across this — and now my plan is mac and cheese with an arugula salad on the side! Not at all what I had expected, but boy oh boy does it sound yummy. I made this with ricotta rather than cottage cheese like a few commenters had suggested. Not worth making again that way. It tasted fine, nothing special, and was a bit greasy. It also was unattractively chunky-looking. One of my kids wouldn’t even taste it because she thought it looked so gross. If I’m going to eat something with a pound of cheese in it, I want it to be knock-your-socks-off delicious. With ricotta, this was not. The amount of pasta appeared so disproportionate to the huuuuge amount of cheese that I was skeptical – but I, um, might have just eaten almost a half-pan by myself. I didn’t have cottage cheese, so I used enough sour cream and french onion dip (heh) to equal 1 cup, and added a few dashes of hot sauce. GEEZ. Easiest mac and cheese I’ve ever made, and definitely a repeat. It’s not smooth and refined, but it reminds me of Grandma-type mac and cheeses at church potlucks. That’s a good thing. just tried this gem and it turned out fabulously! thanks for posting. i misread your instructions and ended up blending most of the cheddar in with the cottage cheese mixture and it actually came out swell. we also had wet mustard not dry, and i used a tsp of that and it was great. i love that the recipe is so forgiving! husband, myself, sister-in-law, AND brother-in-law were happy all around! served with wine and an apple/arugula salad. the cheese and apples were a hit! Kim — The other mac-and-cheese will probably freeze better. The cheese in that one is suspended in a thicker sauce; it’s creamier. This one is best when first made. Loved this recipe- for my teenage daughter I substituted quinoa pasta and skim plus milk. Dijon mustard was fine. LOVE the no-cook pasta idea. I just forwarded this recipe to my married working daughters who are always looking for easy and hearty recipes for their hungry hubbies. Deb- I love your new cookbook- wishing you continued success! Marlene. I made this a few days ago for my classmates and it was a big hit! Making it again tonight for my boyfriend and myself. I wanted to chime in here because I used a tiny amount of nutmeg this time around (didn’t last time) and my kitchen smells like heaven! Made this on Christmas to go with fresh ham. It was a major hit! Used whole grain pasta and it was still fantastic! I have made this several times now. Love it. My favorite substitution has been Creme Fraiche for the cottage cheese. It was all I had in the fridge one night and so used it instead. For the people who don’t like cottage cheese I thought it made everything even more creamy. I also have been throwing in some black truffle oil, just a couple of teaspoons. People seem to think it takes it over the top. Personally I didn’t notice much difference. I made this this weekend and it was so delicious. I was skeptical since it didn’t require making a cream sauce, like most recipes do, but this one was absolutely perfect, especially when paired with a nice light salad. Did you ever try blending the cottage cheese first before adding milk? Great mac n’ cheese recipe. I will be making this again. Oh my goodness! This recipe is so good! I’ve tried making other mac and cheese recipes and none measure up to this one! Sooooo good! I’ve made this twice now and both times my dinner guests were floored. I used yogurt instead of cottage cheese and whisked the wet ingredients together, and I had some purple curly kale lying around that I tore up and mixed in. I’ve been thinking of mac and cheese for ages. Yesterday I tried to make it. I looked for a recipe without bechamel sauce. I found an easy one and made it. It called for 2 eggs, mustard and worcestershire sauce. Well I dropped the bottle. I had another but the smell from the broken bottle put me off. I can’t get sharp cheddar where I am. Only special cheese shops. I didn’t like it but yours sounds lovely. Jamie Oliver usez cottage cheese I stead of bechamel in is half hour meals programme. This is a winner! I have had terrible luck with baked mac & cheese recipes, but even the 5 year old agreed – this one rocks! Yum! Made this tonight – was feeling a bit too hungry to wait for an hour for the dish to cook and for some reason just HAD to have mac and cheese tonight and this recipe looked the best… so there were some speed-up adjustments I made. I poured the milk and cottage cheese mixture into a pot, heated it up, added a little butter, salt, pepper and added the pasta to the mix. While I was grating the cheese and sauteing mushrooms (I had some for using up) the pasta got nice and soft. I added cheese, mushrooms and some additional milk to the pot, poured everything into a baking pan, put some cheese on top and stuffed it into a preheated oven. 15-20 more minutes in the oven were enough to have wonderful mac and cheese on my table! I made this with whey instead of milk and it was great! I’m happy to have another use for whey. Thanks! Have made this many times – usually cooking in individual 14 oz. ramekins, and it is so ridiculously good and insanely easy, and works just as well with gluten-free penne. One note though – this recipe serves about 4 if making individual servings. It worked! It worked! Even at altitude (6200 ft), it worked! I did not add more liquid like I often need too. Fiance gobbled it down, going into the rotation for easy/fast meals. W00t! It’s 3 in the morning, and I just woke up really hungry, so I tossed this dish together. It was PERFECT. I wasn’t sure a 9×9 square dish would be large enough, but it was just right. I followed the recipe exactly was written, though I was unsure of the cottage cheese (which I generally despise). But it gave the dish a depth that most mac and cheese recipes are missing. Also, if you think a 9×9 pan won’t make enough for a family, don’t worry. As Deb mentioned, make a salad with it, and this will be plenty. I have a history of annihilating mac and cheese, haha, and all I needed was a good scoop to be satisfied. I added garlic powder, oregano, and parsley for an herby version. I also baked it in a 8ish” x 12ish” pan to maximize golden crust to cheesy goodness ratio. Deb, Would you consider substituting the cottage cheese with ricotta? Thanks. Claudia — Definitely, and I think some people have used mascarpone too, which is even more smooth and rich. I love this recipe. Next time I will use less macaroni as I like mine creamier. Thanks so much! Just made this with jalapeños and bacon! Needless to say, it didn’t make it to the fridge. This reminds me of my father’s macaroni and cheese recipe which is the only mac-and-cheese I had growing up and is still, with only a few deviations, the one I make. Boil pasta until al dente, drain and then add all other ingredients. Mix well, bake at 350F for about 30 minutes, or until golden, delicious and bubbling. Yum. Wow, this is so good! I halved the recipe and put in two pinches of cayenne pepper and I might eat the entire pan on my own. Just have to say, I’m now in a food coma. This was the best Mac and cheese I have ever had… I came to your site looking for a macaroni and cheese recipe earlier today, and so happened to have all these ingredients on hand… I subbed half the pasta for raw cauliflower, and just mixed it with the noodles and cheese mixture in the very beginning… I will never make another macaroni recipe ever…. AMAZING ! This is the best mac & cheese recipe — it’s versatile and simple. Kicking myself for the times I’ve made a bechamel when this existed. Made it twice now — tonight, with goat Gouda and a few bits and pieces left in the cheese drawer, added some scallions, too. I’ve never had cottage cheese around for it, but yogurt stands in just fine. Like another poster, I did half and half cauliflower and elbows and it was like scalloped veggies and mac/cheese had a baby. Yes, please. This is GOOD. I made a half-batch last night and due to family dietary requirements (my husband is mildly lactose-intolerant, altho he gets on better with well-cooked dairy, and doesn’t do well with sharp spices; Mom for whom I’m also cooking is *supposed* to be on a low-salt, low-fat, low-cholesterol diet, but owing to years of hot-pepper eating, has burned out her taste buds so anything not rather highly seasoned tastes bland/flavorless to her) made it in 4 individual casseroles. Easy. If you do that, measure everything (literally, 1 oz. pasta + 1-3/4 oz. cheese in each, 3/8 cup milk-mix). Also, reduce cooking time for the small dishes: 20 min. with foil, reduce heat to 350, 20 min. without foil, turn oven off and let them cool in residual heat for 15 minutes. I left out the salt, pepper & nutmeg, subbed mild Dijon mustard (1/2 tsp) for the dry, and made DH’s with all Monterey Jack cheese, then used mixed Jack/cheddar for the rest of us and added a spoonful of green-chile salsa to Mom’s. Perfect texture – the pasta on top was just chewy. I wish I’d remembered to butter the dishes, but I left out all the butter, because the tops looked oily when I took the foil off. And I used 2% milk and cottage cheese, bcz that’s what was on hand. And, adding cauliflower? Trying that next; thank you, Maro! Made this in a dutch oven when camping. It’s a winner. Very rich and delish. What are the nutritional amounts, ie: calories, sat. fat, protein, etc. per serving. I really need that information. How would you freeze this or is this not suitable? I am thinking of lunches for my toddler. For a toddler, probably muffin or ramekin-cup sized. Or you can just do it in a rectangular or square pan and cut it into squares once cold and set and freeze them. Hi! I made this the other day, and was pleased how well it doubled for a 9 x 13 pan. I want to double-y double (er, quadruple) the recipe and make this in large disposable aluminum pans for a potluck lunch for a bunch of hungry teenagers, but won’t be able to make it fresh right before serving it. Am I crazy for trying to make that big a batch, keeping it in the fridge overnight, and then reheating it before serving? What, if anything, could go wrong? This is my go-to mac and cheese recipe. Last night I added Frank’s red hot sauce and chopped up cauliflower for some more zip, and it was great. Next time I do it that way, I think I’d add some blue cheese and maybe some scallions. I have made this (awesome) recipe a bunch of times and it has always come out perfectly…until recently. The past two times I have made it, the cheese and pasta don’t come together and I get goopy cheese mixture next to barely covered pasta. The only thing I think that has changed is location…we moved, so new oven. Any ideas before I move on to your other Mac and cheese recipe? Thank you!! This was a rare miss for me of the recipes on this site. I have been aware of this NYTimes recipe for awhile and was always skeptical, but finally figured since it was on smitten kitchen it was worth a shot. Granted, I altered the recipe by substituting ricotta for cottage cheese, so this isn’t entirely a fair review, but I did not love this. I found it edible, but the texture was weird, and my 6 year old refused to eat it. And if I’m going to make mac and cheese from scratch, even one as easy as this, then it needs to be one that my child will eat. I am currently searching for my favorite macaroni and cheese recipe, and am trying a different recipe once per week. Based on internet comments, I am probably going to end up loving Martha’s Macaroni and Cheese the best, but in the name of science and cheese I must rule everything else out first. Currently tabbed recipes include ones from Smitten Kitchen, America’s Test Kitchen, Alton Brown, Ina Garten, Michael Simon, NY times, The Guardian, and Slate. The only thing I haven’t decided is whether to try Martha’s Mac and Cheese now (after which everything else may be a disappointment), or last (when we are all thoroughly tired of macaroni and cheese). I started with this recipe, and have made it twice. The first time I made this I followed the original recipe (meaning I included the nutmeg), but used your advice to puree the cottage cheese first which helped smooth it out. I ran into only one (human error) problem. After the first baking period, when I removed the foil, I accidentally turned the oven off. I turned it on again before putting the macaroni and cheese back in, and it was on when I checked on the macaroni a few minutes later. But when I went to take the macaroni and cheese out, the oven was off. Was there some mysterious oven-only power outage? Unlikely. Did someone else turn the oven off? Did I actually forget to press start, and thus the oven was slowly cooling down to around ~200 (I checked the temperature the oven turned on at after removing the mac and cheese) for the second half hour? Probably. Still, the cheese melted surprisingly well. It looked as if it had finished and set, and the cheese on top was clearly melted, if not browned. Unfortunately as soon as I scooped some out I could tell that there was a problem. It glooped onto the plate. The cheese had definitely separated, and oily liquid oozed out of the mound of macaroni. There were good aspects, however. It was very cheesy and sharp. The mustard wasn’t too strong, and you could taste a very slight heat from the cayenne. The noodles absorbed liquid well and yet still had a bit of a bite to them, like al dente pasta. It was the same when reheated. I made it a second time to give this recipe a fair shot, without messing up part of the cooking. I still followed the recipe, but also made some brand changes (listed below). The second time the macaroni and cheese browned beautifully on top. It didn’t form a thick crisp shell, only a thin one (I had centered it in the oven). The cheese sprinkled on top partway through cooking had separated, but the rest of the macaroni and cheese had not. The noodles were tender (as I suspect they were meant to be the first time). The cheese flavor was sharp and strong, despite me only using sharp cheese, not extra sharp. The spices weren’t really noticeable this time, however. The cheese was a bit grainy, not smooth as it would be with a cheese sauce. I’m not sure if this was a problem I had, or just how this recipe works. Overall, it was very cheesy and tasty. The cheese did separate on re-heating, but that was expected. 4. Ovens may heat from the top, bottom, or both. In general, the center part of an oven is the safest, using lower shelves browns the bottom of your dish or helps center a really tall dish, and the upper part is the hottest and helps brown the top of your dish. 1. First time: may have accidentally turned the oven off. Second time: No problems. 2. First time: used 8oz Cabot extra sharp New York style cheddar and 8 oz Cabot sharp Vermont cheddar cheese (or the sharp NY and extra sharp VT, don’t remember). Second time: used 16 oz Cabot sharp Vermont cheddar cheese (white). 3. First time: Used Friendship 4% small curd California style cottage cheese. Second time: used Breakstone’s 4% small curd cottage cheese. 4. First time: Put casserole dish in the upper third of the oven (second from the top, of 5 racks). Second time: Put dish on center rack. 5. First time: measured out everything in advance, so that things were sitting on the counter and inching closer to room temperature. Second time: Grated cheese in advance and put in fridge, kept each ingredient in fridge until last possible moment. 6. First time: Mixed cheese and milk mixture, then noodles, and let it sit for a few minutes while oven warmed. Second time: Mixed noodles and milk mixture, then cheese, and put it in the preheated oven right away. 7. First time: Land O’Lakes unsalted butter. Second time: Fancy European style Land O’Lakes unsalted butter (higher fat content). 8. First time: I didn’t need a whole tablespoon of butter to grease the pan, but I sort of mushed/smeared the extra on the bottom. Second time: I didn’t need a whole tablespoon of butter to grease the pan, so I only used what I needed, naturally. 9. First time: freshly grated nutmeg. Second time: already ground nutmeg. I have no idea which of these changes caused the cheese to not separate. But they are possible solutions. This was sooooo good BUT my sauce curdled/ which happens every time I try a Mac and cheese recipe without a roux. Can anyone help?! I would love to make it again. Thanks! Can you eliminate the cottage cheese (something I never have on hand or buy) or perhaps substitute something else successfully? I love the idea of no-boil pasta and everything in one pan. I have been making this for years and never have cottage cheese on hand. I use a bit more milk. I also use high quality whole wheat macaroni because that is what is on hand. This recipe is very forgiving. Do you think I could make this in a slow cooker? If so, what time and setting should I use? Curdled or just a little grainy from the cottage cheese? Would someone please speak as to why this recipe curdles? I love the flavor and have made it 3 times with different cheeses and get the same result every time. Curdled- not grainy. Taste is good but not appealing since the sauce comes out of the oven and is curdled. I’m sorry to hear. I haven’t had curdling on this but it is near the top of my to-revisit list this winter so I should be able to tell you more soon. That would be wonderful!! Thank you! Does this version of mac and cheese freeze ok? Yes, it should freeze well. Hi – was about to make this for a meal train. In 2012 you said the other mac and cheese would freeze better and in 2018 you said it was fine to freeze this one. I’d rather make this one — I’ve made it multiple times — but if they reheat it I’m concerned it will separate. Thoughts? Do i freeze this raw or cooked?